What Can I Plant Now? Summer is in full force, but that doesn’t mean that planting season is over. Some flowers and plants actually prefer the heat—it’s never too late to start a new variety. Take advantage of this lull in the traditional planting schedule by filling in your gardening gaps. Before you know it, the temperatures will start to drop for fall. Get ready by browsing the many gardening products and supplies available. There’s more to do in the garden this time of year than harvest tomatoes and peppers. 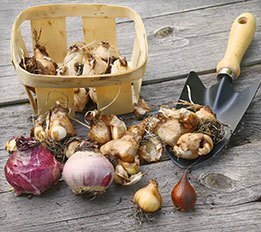 Think spring by planting bulbs that will emerge next year thanks to your preparation. Look for “fall bulbs” such as crocuses, daffodils, tulips, and hyacinths. Spring-blooming flowers like irises need to be planted now so that they have time to become strong enough to survive the winter. Popular spring-blooming flowers like tulips, daffodils, and grape hyacinth can be planted anytime from now until September. If planted now, the saffron crocus and other similar varieties will bloom from September until November. There’s no need to be too conservative about purchasing plants in late summer since many varieties can always be divided next year. This is a good time to not just plant, but to replant as well. If your perennials have gotten too big, dividing them will ensure their continued productivity. They’ll have time to establish roots in another location if they’re moved now. Spring perennials such as columbine and violets need to be cut back by half before being divided. To do the actual dividing, dig bulbs up then slice them in two to four pieces. Choose the healthiest specimens first when replanting, and make sure to spread them out. Don’t forget to trim daylilies and hostas before transplantation. The late summer and early fall are also good periods to reestablish some varieties of shrubs and trees. Deciduous plants that are container-grown or balled and burlapped are the best candidates. Spring may be over, but fresh vegetables are always in season. Consider planting fall vegetables that mature quickly, such as greens and roots. Examples include arugula, beets, carrots, Chinese cabbage, collard greens, kale, mustard greens, peas, radishes, spinach, Swiss chard, and turnips. Study the particular type you want in order to determine the best planting time. It’s important that fall veggies have the opportunity to mature before the weather gets too cold, and determining the average first frost date can help with these calculations. You can also plant “green manure” right now. This way, you can add organic matter to the soil while preventing weeds and soil erosion. Legumes like vetch, alfalfa, clover, and peas count as green manure. Enjoy grasses? Annual ryegrass, oats, winter rye, and winter wheat are good for your yard. Broadleaf plants also count as green manure; take a look at rapeseed or buckwheat. To prevent weeds, plant green manure thickly. You don’t want this groundcover to transform into weeds, however. If it flowers before being killed off by winter frost, mow it down. In late fall or early spring, you’ll want to turn the organic material into the soil before doing anymore planting in the area. Remember, Delhi is always here for expert advice. Stop in and let us help!